I love looking at people’s organization ideas, don’t you? I have gotten so many great ideas from Pinterest and different blogs, and I can never get enough. 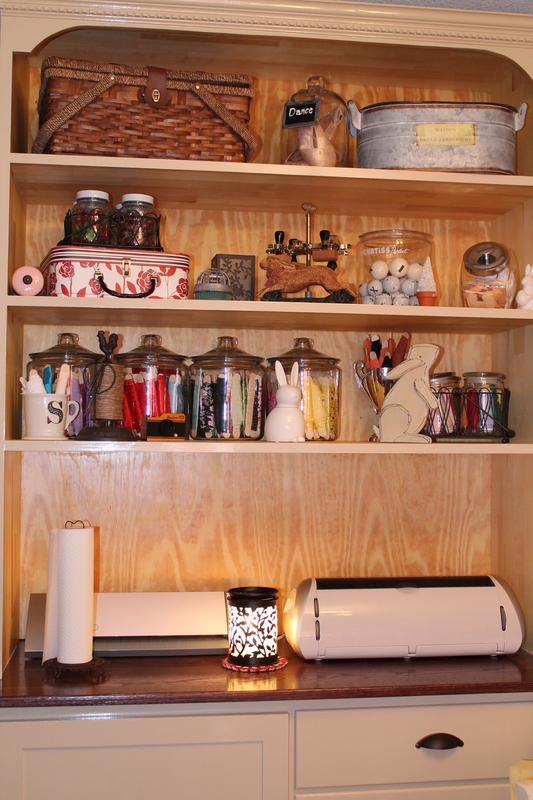 When my sewing room is well-organized, I feel inspired to get in there and get something done. 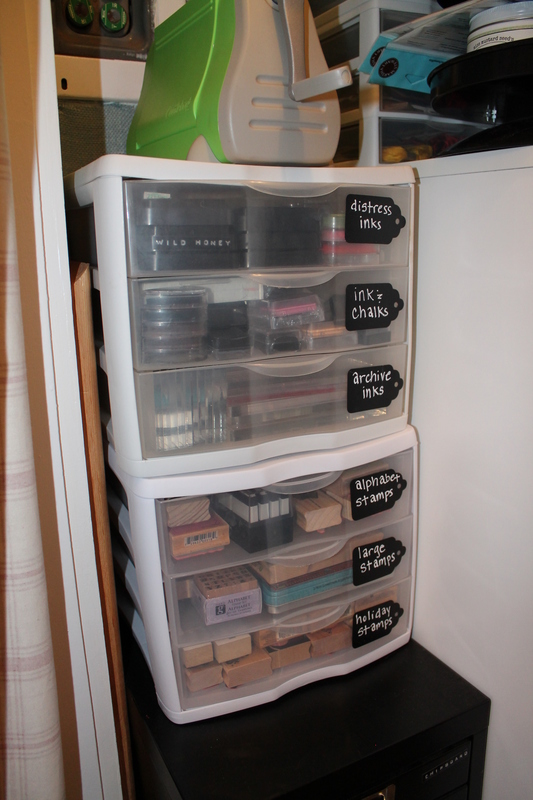 I thought I would share some of my own organization ideas with you. I’m finalizing the cabinets and closet right now, so I’ll have a new post in a few days, but for now, I hope something in my room will inspire you! 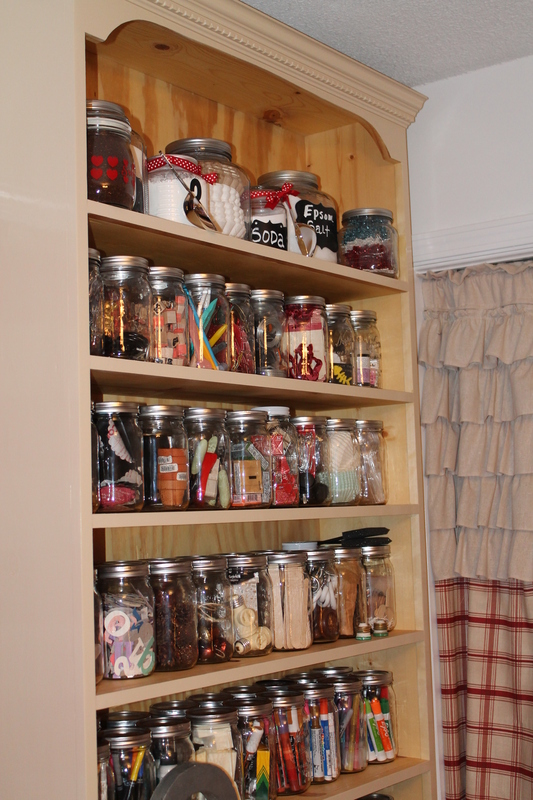 I like to store as much as I can in these mason jars because it is so much easier to find things this way. I have two rows, so I can put like things together, too. 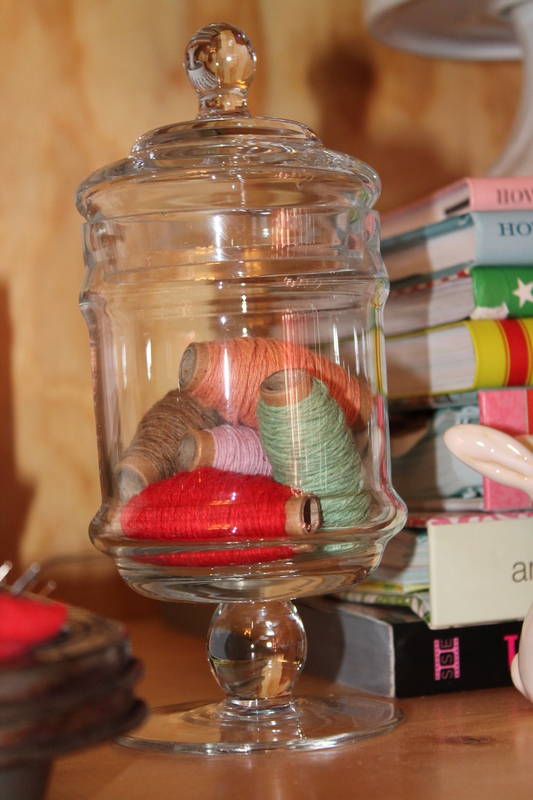 Much of my sewing odds and ends are in these jars, and I even have some electrical supplies for a project or two. 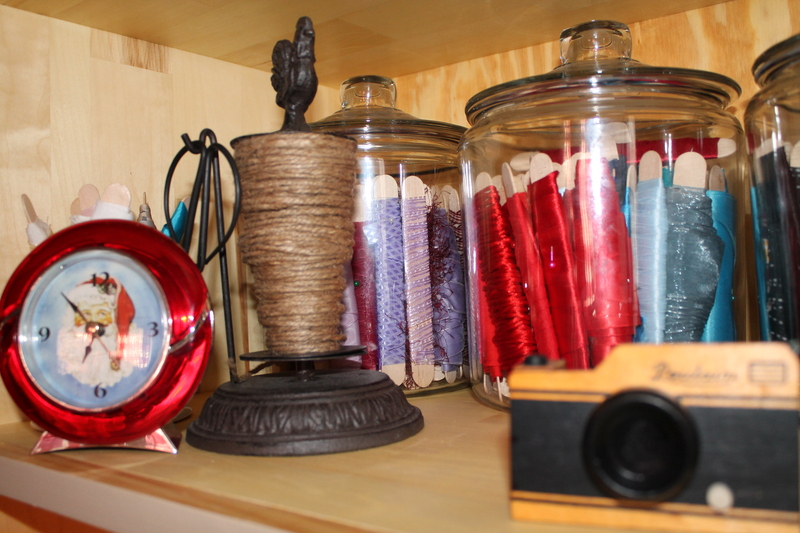 I keep my thread on a holder so that I can keep it untangled and also know what I have on hand. 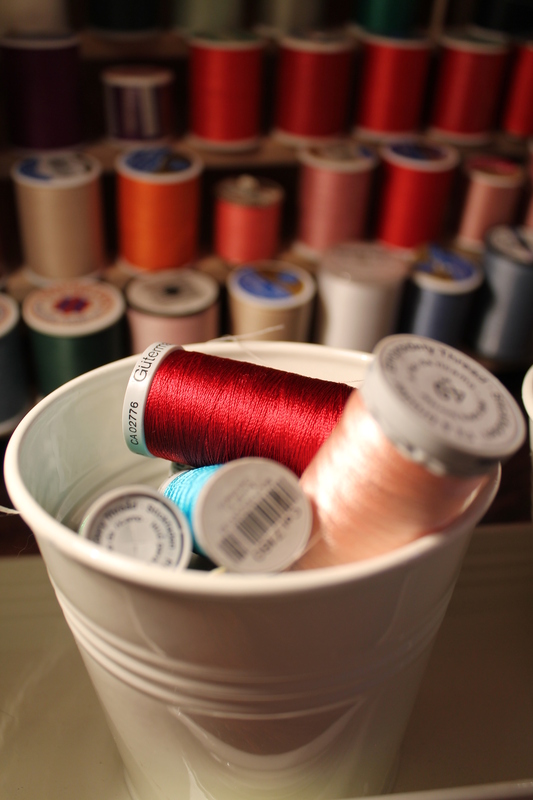 For current projects, the thread I need is in this little bucket. 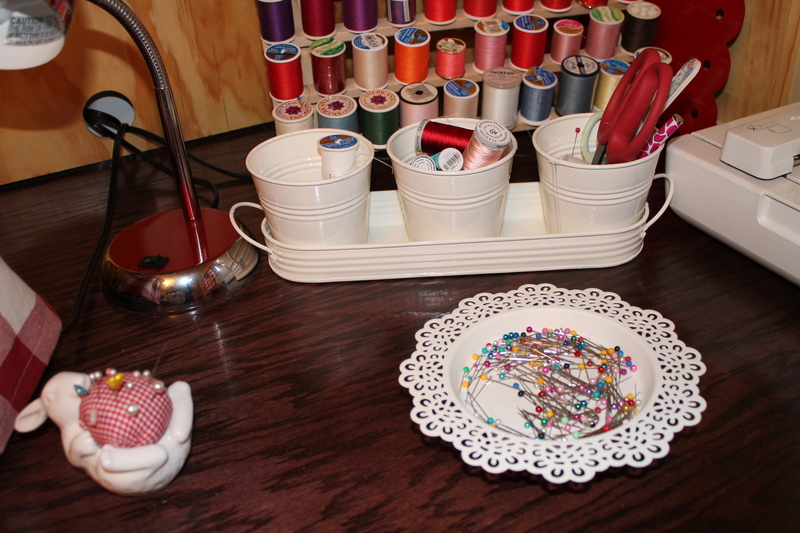 This tray holds my sewing supplies, and the little dish holds pins. 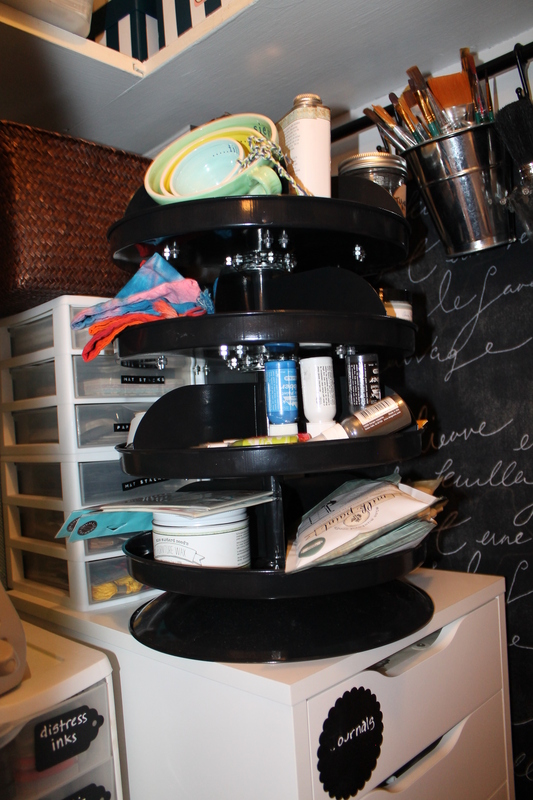 I got this at IKEA in Dallas and put a heavy duty magnet on the bottom. I also use the little rabbit pin cushion. It’s one of my all-time favorite things! 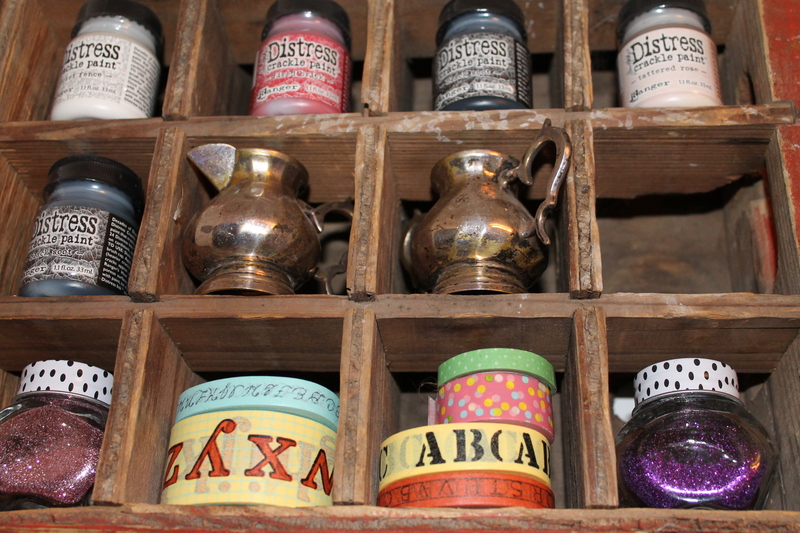 I store some small jars and rolls of washi tape in an old Coke box. The little jars are wedding favors from Walmart, and the little cream and sugar silver set is from an antique store on 6th Street in Amarillo, which is on the old Route 66. I love these jam jars. If you ever get a chance to try Bonne Maman jelly, you should jump on it. It is wonderful jelly, and the jars are adorable. I’m not a paid spokesperson, but I should be because we buy tons of their jelly and use it in all kinds of pastries. 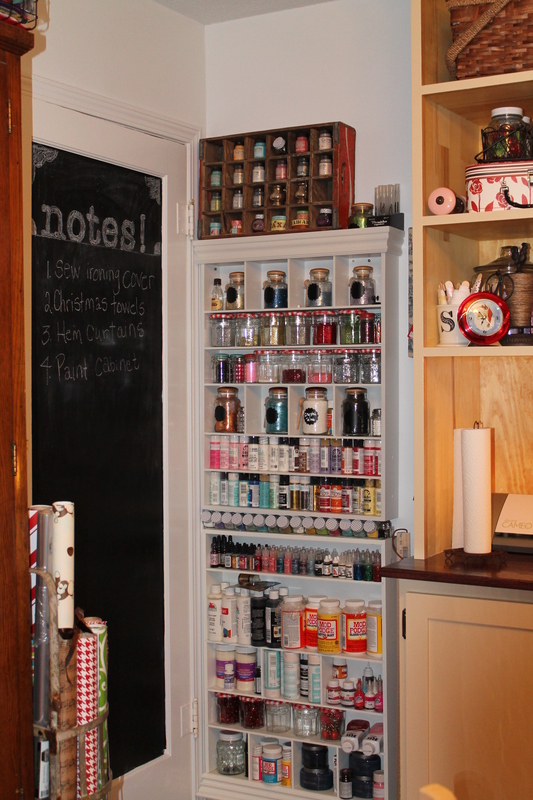 This is a behind-the-door solution to lots and lots of small bottles of things. 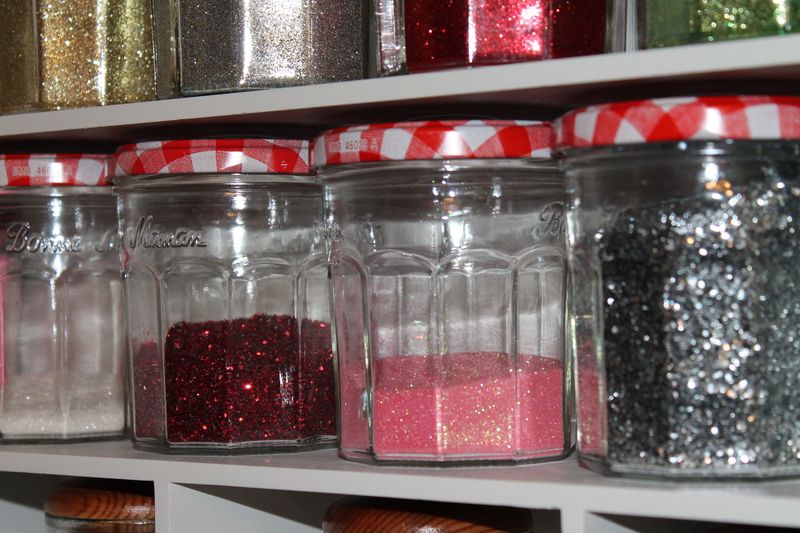 I have everything from glitter to Mod Podge to Rit Dye stored here. 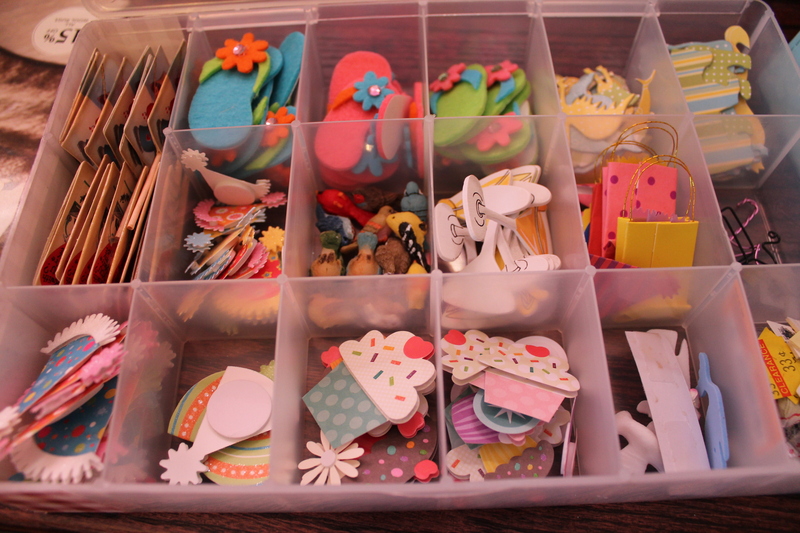 I stacked the two units together that I got at Michael’s with a 40% coupon. I also have a paper towel holder on the paper cart. I think it’s important to have paper towels handy, especially for painting and working with other liquids. I have only a few books and some embroidery software, so I keep them handy. The vintage muffin tin holds sewing ods and ends, and the green and white picnic pail holds scissors and small embroidery hoops. The pink truck is a pin cushion my daughter made for me. I cherish it because she painted it and sewed the cushion just for me. 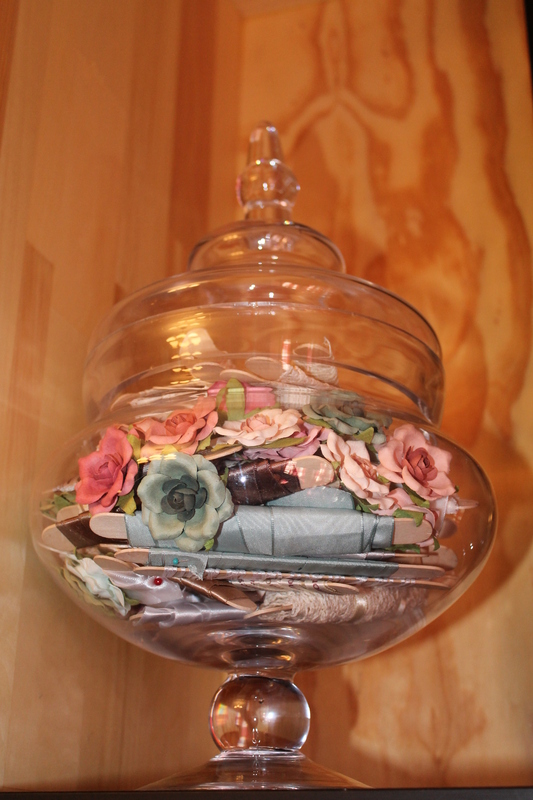 I keep ribbon and flowers that I want to use for specific projects in this jar to make sure I don’t mix them up with other supplies. 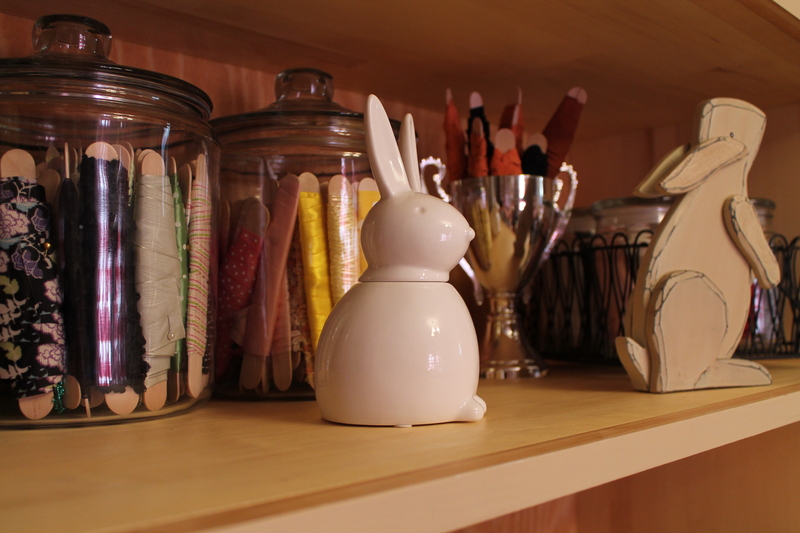 This little bunny holds cotton balls, and the trophy behind him holds ric-rac. 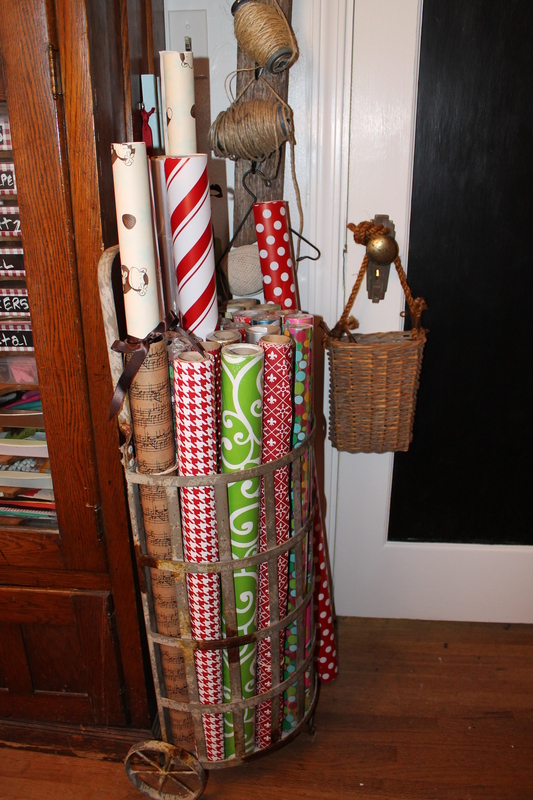 I keep my ribbon on large craft sticks so that I can see what I have at a glance. 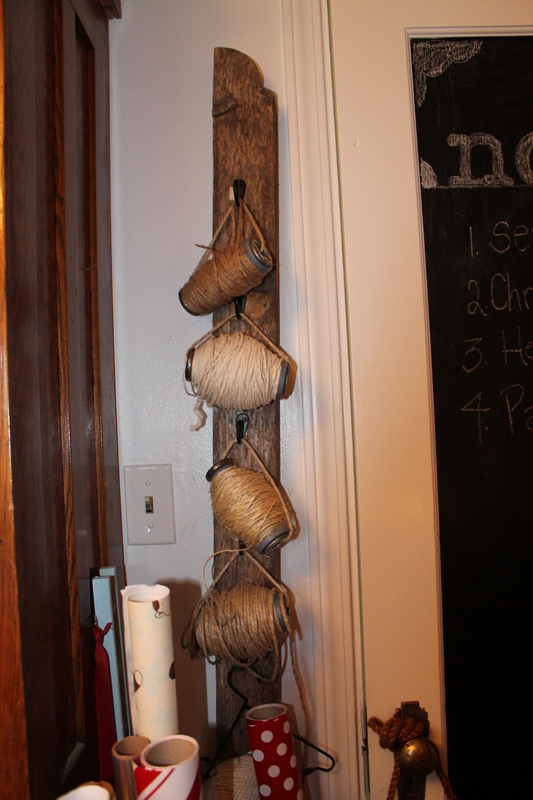 I got this twine-rope holder from Antique Farmhouse, and I can’t tell you how often I used it. I will have to get more of the rope one of these days. 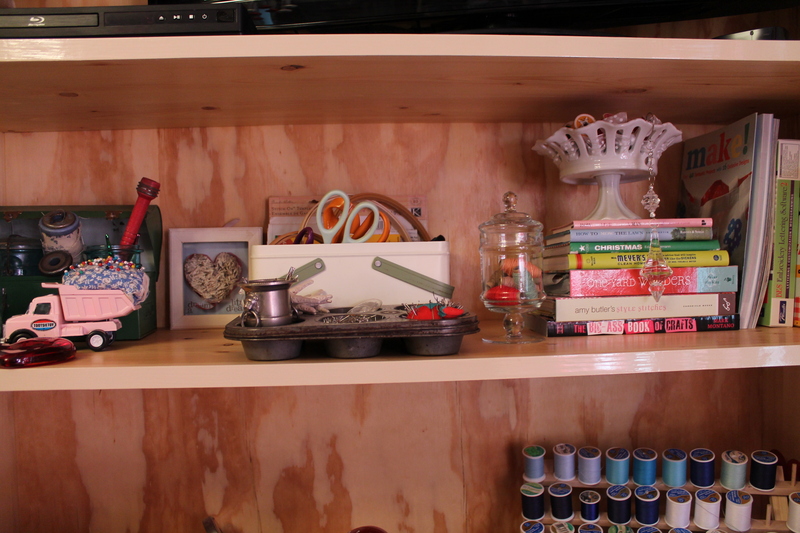 That little camera in the forefront is from Anthropologie, and it holds washi tape. 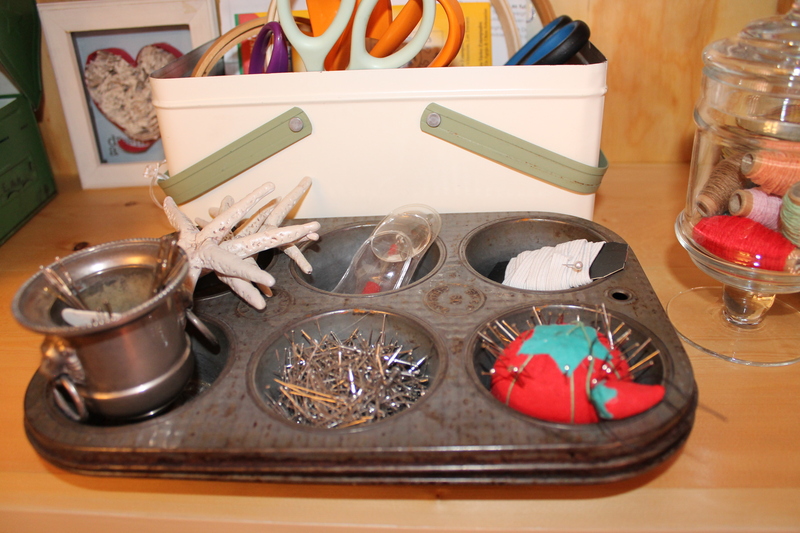 This entry was posted in Craft Room, glitter, home, organization, sewing, storage, Uncategorized and tagged organization ideas, sewing room; craft room; craft supplies; organizing; sewing supplies; mason jars; Bonne Maman; Anthropologie; ribbon storage; scissor storage; ink storage; stamp storage; Iris; by Shannon. Bookmark the permalink.